The mechanism of the Birch reduction. Part 1: reduction of anisole. The mechanism of the Birch reduction. Part 2: a transition state model. I promised that the follow-up to on the topic of Birch reduction would focus on the proton transfer reaction between the radical anion of anisole and a proton source, as part of analysing whether the mechanistic pathway proceeds O or M.
To add some context, Hammond’s postulate  states that “the structure of a transition state resembles that of the species nearest to it in free energy.” If the structure of the transition state for proton transfer above resembles that of the radical anion precursor we would call this an early transition state and it would be a reasonable approximation to infer properties of the reaction from the properties of that radical anion. The previous post explored those properties via the computed molecular electrostatic potential (MEP) and the highest energy NBO (natural bond orbitals, which are used here instead of molecular orbitals). Unfortunately, they did not agree with each other. Remember that Hammond’s postulate dates from 1955, an era when it was not practical to compute the structure of a transition state directly using quantum mechanics (certainly not so for such a complex reaction as that shown above). Indeed, one might argue that such a structure has only become computable in a practical sense very recently! 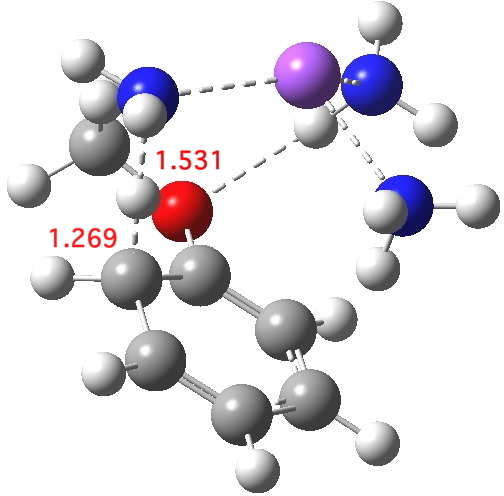 As I showed previously, the radical ion-pair resulting from a 1-electron transfer from sodium to anisole has a dipole moment of ~11.6D, and the reaction is conducted in a solvent of medium polarity. This combination means that one really is obliged to take into account the dielectric of the solvent, and indeed any strong explicit hydrogen bonds that might be present. The codes for doing this have really only recently become robust enough to tackle such an endeavour, which might explain why such calculations are not yet abundant, or ubiquitously cited in the text books. Proton transfer for M mechanism. Click for 3D. The proton transfer via one M mechanism is shown above. The proton source is ammonia, which is known from experiment to lead to sluggish reactions (the more acidic t-butanol is often added to speed up the reaction), but we can see that the transition state is very late, νi 423.8 cm-1. The N…H bond is largely broken, and the C-H bond is mostly formed. The dipole moment is 7.7D, also different from that of the reactant. Perhaps, knowing this, it is not too surprising that inferences based on Hammond’s postulate as applied to the reactant are not reliable. The value of ΔG†298computed from this model is 22.8 kcal/mol, which is on the high-ish side for a reaction to occur readily at room temperatures or below. This nevertheless nicely conforms what we already know, that a more acidic proton donor is needed to achieve a fast reaction. Proton transfer for O mechanism. Click for 3D. The proton transfer via one O mechanism is similar, but a tad less “late”. This already raises doubts about application of Hammond’s postulate to this system; one cannot really compare two reactions in which each reactant differs in its resemblance to its transition state. The dipole moment of this alternative transition state is also 7.7D, but the transition imaginary mode is much higher at νi 869 cm-1. The free energy barrier is 21.0, some 1.8 kcal/mol lower than the barrier for the M mechanism. This corresponds to a rate about 21 times faster for O over M (at 298K). 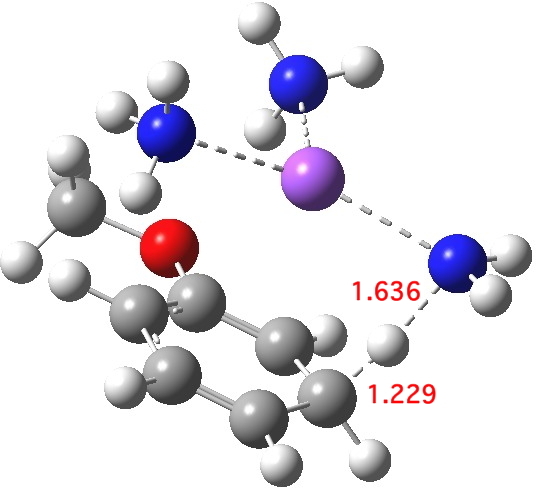 To conclude, we characterise two (of the four) isomeric transition states for protonation of the radical anion intermediate in the Birch reduction of anisole. These two transition states are actually different in several subtle regards, differences which would not have manifested if only the properties of the reactant had been considered. The final word must be that the text books are likely correct on this one, although a little more work is still needed to tidy up loose ends. This entry was posted on Monday, December 3rd, 2012 at 3:12 pm and is filed under Uncategorized. You can follow any responses to this entry through the RSS 2.0 feed. You can leave a response, or trackback from your own site. The mechanism of the Birch reduction. Part 2: a transition state model. is licensed by Henry Rzepa under a Creative Commons Attribution-Noncommercial-Share Alike 3.0 United States License.